WE’RE BACK. Another big thanks to the awesome folks who kept us going with glorious guest strips. Good to be back in the saddle though. During our “break”, the new Pokemon came in hard and fast. So far I have managed to escape its clutches, choosing to abstain until a magical and elusive period somewhere in the vast future I like to refer to as “when I have more time”. But B, he done got sucked right in. This fantastic strip sums up his last few weeks pretty darn good, I’d say. This also introduces our new character in-strip for the first time, baby Kahlan! You’ll be seeing lots of her over the next forever :). Babies, am I right? I hope this one speaks to you other parents out there as much as it does to me. 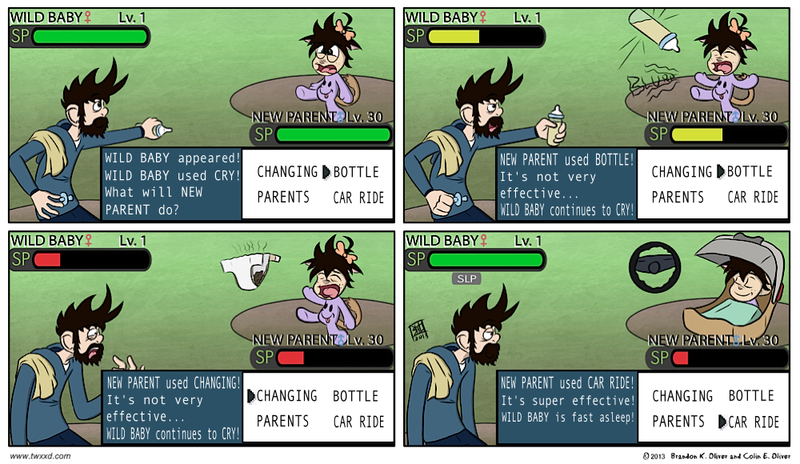 So the next part is new parent uses improved sneak and then powernap abilities? And eventually evolves in to Parentzard! Talk about a game changer! Fun to see Kahlan’s first comic strip appearance! Welcome back guys! Be warned, few things will work every time. Good luck! Awesome comic. The baby is already bringing so much inspiration. Even for the guest strips. As a Dad and web comic person I would like to say that this is my favorite comic of 2013. I take this as the highest praise possible. Thank you, sir.